Does your office have the problem of a lack of storage space combined with a lack of security? Sliding Mobile Shelving with remote controlled security doors from StoreMoreStore is the solution to both of these problems. 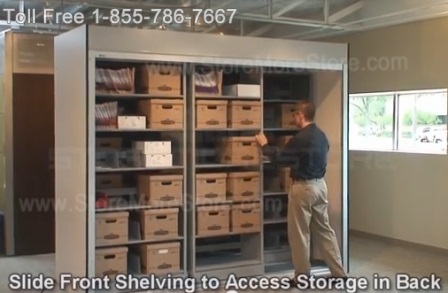 The Sliding Mobile Shelving is designed to make your file storage area more space efficient while the remote controlled security doors will make sure all stored items are safe and secure. The remote controlled security doors come in widths up to 12’ long and up to 20’ high. You can use them in place of hinged doors. This means no more opening and closing multiple doors to find what you are looking for or having to keep track of all the different keys. With just the simple push of a button, you can roll up multiple doors all at the same time! Also the doors are designed to roll up on top of the shelving instead of swinging out into the aisle way. Each of the shelves is adjustable on 1 ½” increments to provide extra flexibility. The Sliding Mobile Shelving is available in numerous colors that have a textured powder coat finish to make sure it’s long lasting. All shelves are supported with 2 heavy duty double rivet shelf supports. Each shelf is rated to hold 250 lbs. Because the Sliding Mobile Shelving is modular, you can add storage capability at any time. A leveling track, heavy-duty carriages and specially engineered rubber stops ensure smooth movement. Quality construction includes ball bearings and four wheels per carriage to improve mobility. StoreMoreStore has a variety of Sliding Mobile Shelving and remote controlled security doors to meet your specific storage needs. Contact us today at 1-855-786-7667 to learn more! Do you need more filing space to store files, records and documents, but you don’t have the available floor space for them? Are you tired of searching in multiple locations for a document because your filing systems is dispersed all over your office building? 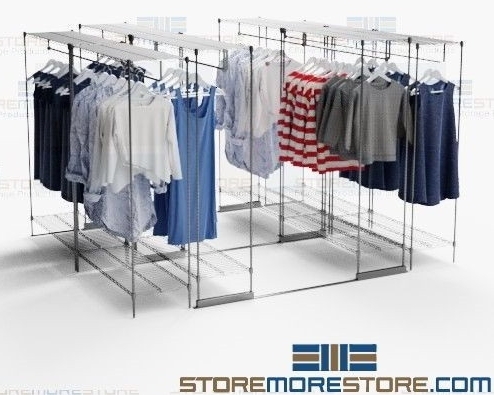 StoreMoreStore’s sliding mobile shelving system using double deep movable file shelves is the solution to both your space and access problems. If you are interested in a sliding mobile shelving system for your office, then consider a double deep movable file shelves. Double deep movable file shelves consist of two rows of shelving. The front moveable file shelves slide back and forth on a track, which allows you access to the back row of stationary file shelves. The result of this filing system configuration is an increase in file storage capacity while using less floor space. Also, because the moveable file shelves are now grouped together accessing files and documents takes less time. • Textured Powder Coat Finish: All parts are powder coated with a textured finish resulting in a durable long lasting finish. • Multiple Color Choices: There are 19 different color choices available at no extra cost. • Shelf Supports: All shelves are supported with 2 heavy duty double rivet shelf supports. • Uprights: Uprights are made of heavy duty 18 Gauge construction available in closed and open style. Key slots are positioned on 1-1/2″ centers allowing for shelves to be adjusted up or down as needed. • Modular Design: Because sliding mobile shelving is modular, you can add file shelves at any time to expand your filing system requirements. • Ease of Operation: Leveling track, heavy-duty mobile shelving carriages and specially engineered rubber stops ensure a smooth-rolling movement for the moveable file shelves. Quality construction includes ball bearings and four wheels per mobile shelving carriage, improving mobility. Ready to Order Double Deep Movable File Shelves? 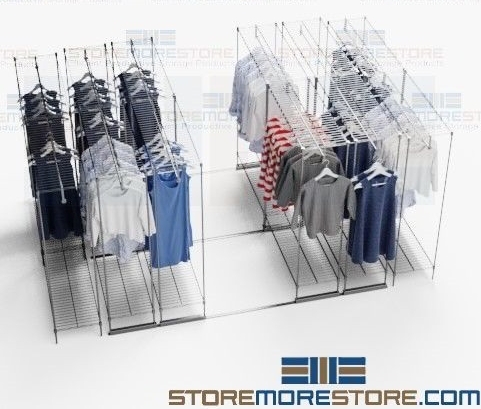 You can find all of our double deep movable file shelves in legal, letter, and box sizes online at StoreMoreStore. If you need help determing which mobile shelving system is best for your office, give us a call toll free at 1-855-786-7667 or send us a message. If you are looking for a different application or a bigger sliding mobile shelving system, we also have triple deep movable file shelves that come in letter, legal and box sizes.